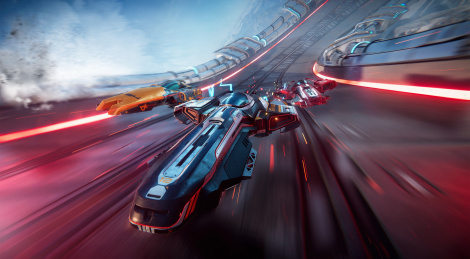 As a potential heir to Wipeout, F-Zero and even Slpit/Second, Antigraviator is quite hard to master from what we've seen. The game is so fast that you really need to memorize the tracks and make a good use of the brakes if you want to reach the top 3 at the end of the race. The possibility to use traps against one's opponents is good on paper, but we find it really difficult to avoid them, even when we trigger them ourselves to slow down those who are ahead of us. More often than not, we end up slowing ourselves down, which is a bit frustrating as the difficulty level is pretty tough for beginners. Also, don't expect to see the sides of the tracks explode as in Black Rock Studio's title, here it's more about avoiding rocks, cubes or mines. The game is now available on Steam if you like what you see. Is it possible to turn off special camera during speed boosts? the ship goes too far ahead of the view. also, vehicle sometimes blocks the view on its own. The way the ship moves feels like some cheap Android game. Kind of like when you have a racing game's sensitivity settings perfect for a wheel or gamepad and you play with a keyboard.